Most "normal" people when they retire look forward to relaxing and puttering around the house or maybe going for a long overdue European or Caribbean vacation. Not 12164 John Dixon. The 61-year old former RCAF pilot decided instead to embark on an extremely long and arduous bicycle ride across the continent, literally from coast to coast, starting when he dipped a tire in the ocean in Stanley Park in Vancouver on the 16th of July 2017. Did he have a Forrest Gump moment and just decide to hop on a bike and head out on an endless road east? No. The moment for him came when a pilot friend, 13687 Jim Ryan, suddenly became a quadriplegic after he broke his neck in a freak accident. That terrible incident reminded him of how fragile life is and how important it is to live life to the fullest while you still can. He also knew that the Canadians who would understand this the most were the soldiers, sailors and airmen physically or mentally injured while serving their country, so he decided to undertake the bike ride in their name and in the process help them out by raising money for the Wounded Warrior program. John is the prototypical retired military airline pilot, like Sully from Miracle on the Hudson - very calm, level-headed and results-oriented. Aside from a few family and friends, he pretty much started the journey without "us", no doubt because he had to have wondered whether he could really do this - it is one thing for the mind to be highly motivated, but a whole different thing wondering whether an aging body will actually hold up to the rigours of several months on a bike. There is also a certain modesty about the magnitude of the one's own mission - would anybody really be interested? Fortunately, for "us", his son Mike set up a great blog as a way of allowing his progress to be tracked and also to allow donations to be made electronically. I imagine his wife Anna-Marie thought he was just a little bit crazy and may have wondered whether this was a long overdue mid-life crisis. However, she was very supportive and in fact accompanied him through the Rockies to Calgary, before needing to head back home to Nova Scotia to keep the home fires burning. For the rest of "us", we first heard about John's ride from our Class of 79 Secretary, 12173 Rich Gimblett, after Anna-Marie forwarded the article posted on e-Veritas. By that time, he was past Calgary and heading in to Saskatchewan. I remember being so impressed that he had even made it through the mountains at his age. I wondered about his proposed route through Ontario, but learned that he was not wanting to think that far ahead - did not even want to allow himself to think about that beautiful light at the end of the tunnel. I knew that must have meant he was hurting quite a bit by then. Nevertheless, we could tell from his regular dispatches that many people were starting to get onboard and getting excited about what he was doing - some even coming out for a ride with him or some offering him a real roof over his head, a warm bed, a hearty supper and a send off breakfast. Among those were several Ex-cadets including 12155 Ed Beth (Moose Jaw), 10615 Charles Pym (Winnipeg), 10455 Jacques Michaud (Montreal), and 21355 Eric Folmer (Fredericton). Other former CF members also pitched in to help along the way, including Kevin Small who accompanied him for some 750 kms and Rick Regan who downed tools at his bike shop in Kingston to complete some emergency bike repairs. It had been some 37 years since I had last seen John, in Moose Jaw, so I did not know a lot of those people he met along the way, including many of his civilian aviation colleagues. That is, until I read that he had hooked up with another of our classmates 12200 Glen MacKay in Duluth on the southern route. Glen had driven all the way up from North Carolina, a 20-hour drive, so he could then ride with him to Montreal. Turns out that they ended up coming by Kingston after all - and you know that modesty I talked about? It showed up again when he asked me if our offer a month earlier to host them was still stood, giving us all kinds of outs if our schedule did not fit their’s. Here he was approaching the 5,000 km mark, obviously bone tired and hurting and yet he was still worried in case they might "inconvenience" us. For me and my wife Brenda, who works at RMC, we were actually thrilled to do our little part to make this happen. I thought I was impressed before their arrival but I quickly learned that what he was doing was even more impressive than I thought. First, although several people generously provided them over night accommodation, and home-cooked meals, in fact John more often than not camped overnight in a small tent and therefore needed to carry all that equipment with him. The weight alone eventually broke the back tire on Glen's bike - he literally had spokes sticking out by the time I found him waiting patiently near Napanee. Later, on the Thousand Island Parkway, after Glen and I caught up with him, I lifted John's bike and was shocked at the weight - I figured it must have weighed close to 100 lbs, which would have made pedaling tough enough on the straight and narrow, but add in headwinds and hills and you get a whole different perspective. Second, John was not able to ride on the Trans Canada in many sections, including all of Ontario, so he had to do only side roads which made the journey longer and inevitably much bumpier, a testament to which is the fact that Kevin said he had to repair his tire at least five times after riding on those roads. While there are some great bike trails in Canada, especially in Quebec as he learned, the reality is that most of the side roads do not have decent shoulders, let alone paved shoulders and are not as well maintained as the main roads [read: lots of pot holes], creating a much riskier bike ride with cars literally inches away (I can say that now that he is done ....). More importantly, those roads tended to much more winding, making the trip much longer. Third, he did a lot of the journey alone - you have to be fiercely determined to be able to put all those creeping thoughts and doubts aside when facing wind, rain and hills, combined with pain in pretty much every joint. 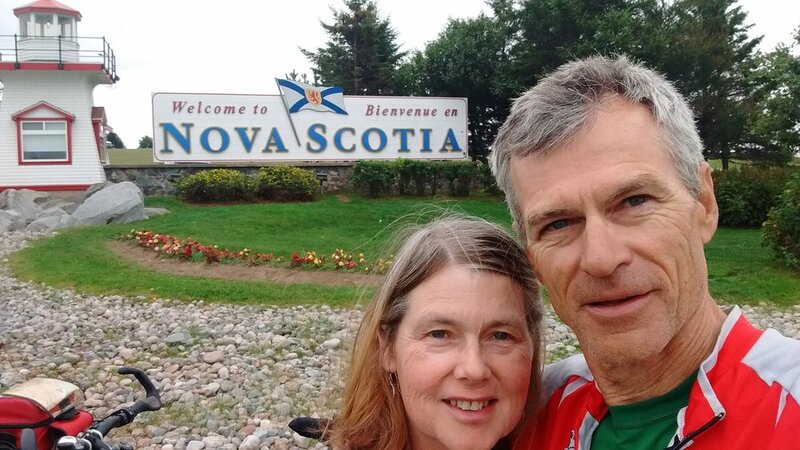 Some 75 days after he dipped a tire in the Pacific, and 6500 kms later, on the 29th of September, with the help of his son-in-law RCAF pilot Captain Matt Dukowski, he dipped his tire in the Atlantic, and officially completed his amazing ride. In typical military fashion, that was a day ahead of plans, and was rewarded with a well-deserved beer with Matt. He has raised $11,300 to date, far surpassing his initial goal of $2,500.